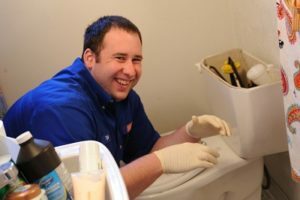 A clogged toilet can sometimes pose a real challenge, even for Clogged Toilet professionals with the proper tools and experience. Most often, a toilet in a residential setting will be clogged with paper, waste or feminine products, although we do sometimes see toys and other small household items when there are children in the home. 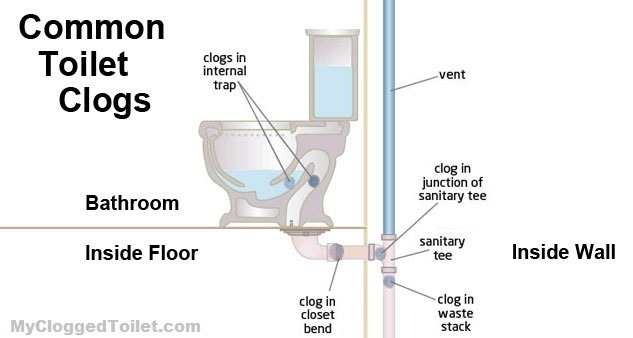 Depending on the type and severity of the clog, there are a couple of different ways for homeowners to unclog a clogged toilet. Those methods are listed below in how to unclog a toilet. Before proceeding to any of the following methods, please be sure that you have securely shut off the water to your toilet. Leaving the water on may leave you vulnerable to accidental flushes which could lead to overflow and flooding. Shutting off the water to your toilet – In most cases, you will find a small valve located on the wall behind your toilet, usually no more than 12 to 15 inches off of the bathroom floor. Place your hand on the valve handle and gently turn it in a clockwise direction until you can’t turn it any further, your water should now be off. If you are unable to locate a valve behind your toilet, you may want to check inside the cabinet under your bathroom sink. If you still cannot find a valve, you should be able to shut off your main water supply with a valve located near your hot water heater, often in a basement, washroom or utility room. The common plunger often serves as the first line of defense against clogged toilets, both in residential and commercial applications. Plungers typically work extremely well on small clogs. To ensure that your plunger will work to its fullest ability, you should check that the rubber is soft, flexible and free of cracks. As plunger ages, the rubber becomes more brittle and begins to crack, causing a loss of pressure and efficiency when used. Using your plunger properly – After shutting off the water supply to your toilet, lift the toilet seat to prevent dripping dirty water on the seat as you pull the plunger out of the toilet bowl. Slowly insert the plunger (rubber end down) into the toilet bowl. The plunger may displace some of the water, causing it to overflow onto the floor. Make sure that the rubber end of the plunger has fully seated around the drainage hole located in the bottom of the toilet bowl. Begin to push the plunger in a downward motion with a moderate amount of pressure and then return to the starting position. Continue to perform this action until the water in the toilet bowl begins to drain. If after numerous attempts at plunging, the water in the toilet bowl does not start draining please refer to the information below on using a toilet auger. If you run into a toilet that can’t be unclogged with a plunger, you are going to want to try a toilet auger. Toilet augers can be purchased at most major hardware stores for around $30 to $50 depending on the store and the size of the auger. In most instances, a three-foot auger will work fine for residential use. If you can’t afford to or do not wish to purchase a toilet auger, you can find them at the most equipment and supply rental stores. 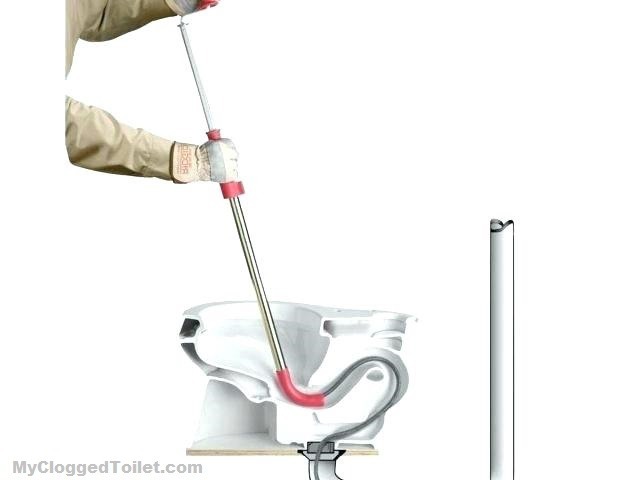 Toilet Auger Using your toilet auger – Before attempting to unclog your toilet, make sure that the water supply has been shut off and that you have lifted the toilet seat to prevent messes and/or any damage that may occur while using the toilet auger. Next, you will want to insert the end of the auger into the drainage hole located at the bottom of the toilet bowl, being careful not to splash the water by inserting the auger to quickly. Once you have the auger in place, begin turning the handle as you apply pressure in a downward motion to extend the inner cable and auger end. Once you have fully extended the auger cable you should see the water draining from the toilet bowl. Slowly begin to retract the auger cable from the drainage hole, making sure to continue cranking the handle so that you break-up any remaining material that may once again cause your toilet to back-up. A snake is pipe devices used to separate and evacuate clogs up that have turned out to be affected by slender pipes. The snake’s outline enables it to flex and penetrate the bends of the toilet’s lower plumbing. Winding itself is simple and just requires one strategy, yet you know how to legitimately discard the removed materials, keep your workspace clean and ensure your pipes. Plumbing snakes are helpful for any mortgage holder. Normal snakes can scratch or harm porcelain toilets, so try to utilize an exceptional snake called auger. It has an elastic covering to ensure the toilet’s porcelain. Put the head in the bowl of the toilet. Start gradually turning the handle clockwise. When you feel opposition, wind the snake back. When the clog has slackened, flush the toilet. If not, wind the snake back in and rehash until jam is broken and the toilet flushes effortlessly. Evaluate the overflow as well as clogged up – Before attempting to unclog a toilet without a plunger, it’s fundamental to perceive how awful the clog is. Regularly, you’ll need to utilize a balance of baking soda and vinegar. For a minor obstruct, you should utilize baking soda and vinegar altogether. For a more extreme toilet clog, utilize littler sums in a few augmentations. Make sure to fix the amount with caution for preventing overflow. The scoop baking soda for minor clogs; you have to pour everything of ready baking soda you quantified into the toilet bowl. For extreme clog up, begin with one-fourth glass to one-half measure of preparing baking soda. Put vinegar into the toilet bowl – you can use equivalent amounts of vinegar and baking soda. 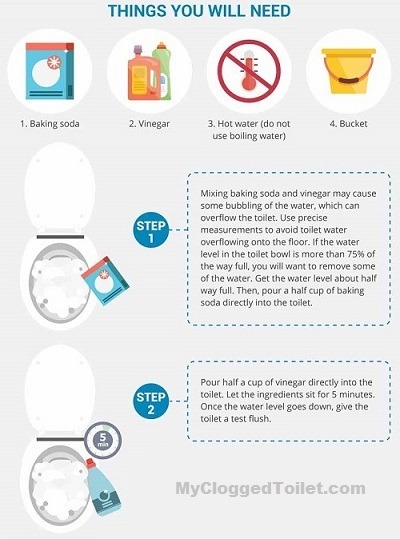 When you put the vinegar into the toilet, it will join with the heating soda. Pour the heated water into the toilet bowl- Mix the vinegar with high temp water. Empty the heated water into the toilet bowl and verify whether the clogged up is discharged. Try it until to the point that the clogged up is discharged – When the block is discharged, toilet makes a snappy suction sound and after that drains normally. Try to flush more than once to wipe out the bowl and you have to ensure the toilet is working as it should. Warmth a gallon of water on the stove over low to medium warmth. Utilize a pot with two side handles for simple pouring later on in the unclogging procedure. Squirt about a half measure of fluid dish soap into the toilet. Enable the cleanser to sit for around 10 minutes. The dish soap alone may remove the clog up. Expel the pot of water from the stove before it starts to bubble. Empty the water rapidly into the toilet. If the toilet is near flooding, first utilize a plunger after the dish soap. Unclog the toilet a couple of more times if the clog up doesn’t consequently vanish down the stuck. Seal the plunger over the exhaust opening and push down and pull up on the plunger a couple of times while holding a seal. Rehash the procedure again with the fluid dish cleanser and high temp water if the clog up still remains. Include some warm water to the toilet bowl before you begin to unclog toilet. After you pour the boiling water in, let it sit for a couple of minutes. The warmth of hot water helps in breaking the blocked stuff. This will make unclogging the toilet easier than with the plunger. The warmth from the boiling water can now and again separate the clogged up, so this could be a decent strategy to utilize in case of you would prefer not to confront the shame of requesting a plunger. Coming up short on choices and the water is proceeding to rise? Attempt this smart trap. Utilize Saran wrap to totally cover your toilet bowl– then give it a flush. As the saran wrap rises, immovably drive the air down. The force of air will remove the clog through the pipe. Detergent can be utilized to separate the things that have clogged up the toilet. The substance response between the sanitizer and detergent makes the clog break. Utilize a couple of things to unclog your toilet and get it back to flushing appropriately. Fill the bowl with a gallon of water. Now empty the water into the toilet bowl. Pour 2 measures of fluid dye and 1 measure of laundry detergent into the bowl. Put more water into the toilet with the goal that the water fills half of the bowl. Permit the water, blanch and laundry detergent to stay in the toilet for 15 minutes. Discourage a plunger over the clog up and gradually twitch to relax the clog up. Try until the point when the toilet is unclogged. Pour 2 to 3 plumb of bleach into the toilet. Hold up 10 minutes; this will give the detergent time to deal with the clog. Turn on the water valve and flush the toilet. Most importantly you should prevent flooding of the water in the toilet. Place a few daily papers or bathroom tissue to maintain a strategic distance from the overflowing. Unravel or rectify the hanger which is secured with plastic in light of the fact that the one made of steel can harm the porcelain of your toilet. Put one end of it into the toilet exhaust and begin moving it in back and forth movement toward the clog. 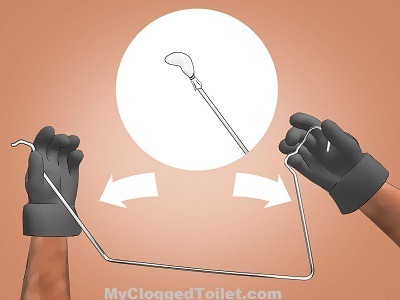 It is definitely a decent technique to unclog a toilet yet you have to get a plunger instantly if the condition gets worse. Read the guidelines gave in your chemical packet. Utilize just the sum that described in the guideline. Additionally, if important, ventilate the room by opening a window, door or by utilizing a fan. Utilize elastic gloves too for keeping yourself safe from chemicals. Expel any abundance water from the toilet bowl utilizing an old container. Place the water in a plastic pail and set it to the side. Leave enough water in the bowl to cover the plunger or the sum suggested by the chemical guidelines. Place the prescribed measure of chemicals into the toilet bowl and enable it to stay there. Utilize a power ball plunger to unclog the toilet or just flush the toilet. Keep diving as required until the point when clogged is broken up or breaks free. Try not to keep flushing, nonetheless, if clog neglects to break up. If the clog up isn’t expelled, rehash the technique as prompted by the chemical’s guidelines. If you’ve attempted to unclog your toilet and fizzled, the blockage might be too far down the pipes for you to have the capacity to reach, or might be inside the mechanics of the toilet. You’ll need to get out a plumber to fix the issue regarding clogging up. There could be various purposes behind your blockage so it’s smarter to put stock in the experts. In case you’re having bothered with a blocked sink or blocked toilet, make certain to peruse their assistance advisers for enabling you to analyze the issue. My Toilet Works Again, What Next? Great! You have managed to successfully unclog your toilet with the professional tips above. Now that the water has drained from inside the toilet bowl, you may once again turn on the water supply and flush your toilet. If your toilet appears to be working well, you can begin the process of cleaning up your tools and work area. There are some steps that you can take to prevent clogs like this from happening again. Make sure to follow our advice on preventing your toilet from becoming clogged to prevent yourself from having to do this again. Answer: There are 3 steps to unblock a toilet without a plunger. FIRST STEP: You have to put as need amounts of dish soap or shampoo into the blocked toilet bowl. SECOND STEP: Enhance a gallon of very warm water to the container. THIRD STEP: Wait a limited minute and watch — the water should disintegration the toilet paper, and the cleanser should help it go down the tube. How do you unclog a toilet fast? 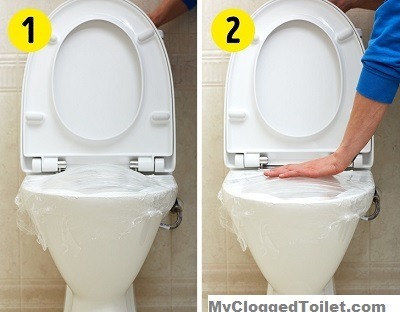 Answer: If you want to unclog your toilet with me then follow this step to unclog your toilet too. STEP 1: Add some amounts of dish soap or shampoo into the clogged toilet. 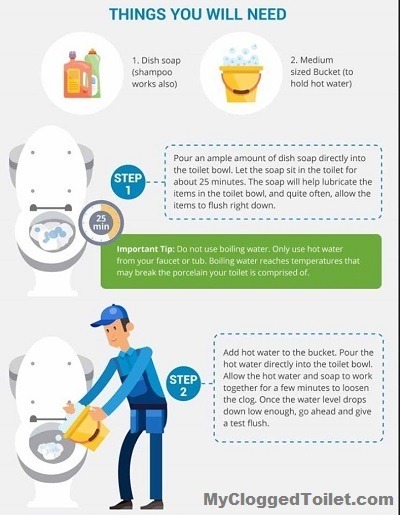 STEP 2: Add a gallon of hot water to the toilet bowl and wait for few minutes then flush the toilet, flush until the clog gone. It works for me every time. What can you pour down the toilet to unclog it? Answer: If you don’t have baking beverage and vinegar on hand, try adding a few shots of dish soap to the lavatory bowl. The cleanser may help to unite the block. This method isn’t probable to work for blocks caused by a hard obstacle, such as a doll. Can I use vinegar to unclog a toilet? Answer: You’ve perhaps used that amusing, bubbly response to clean a blocked toilet, but you can also use it to unblock it. Start by eliminating some of the aquatic from the ball so the response doesn’t get too weak. Next, add about a mug or two of sweltering soda. Then gradually add as much snowy vinegar as you have. What liquid can you use to unclog a toilet? Answer: Pour a healthy quantity of liquid cleanser into your toilet bowl, about half a cup. The soap is thicker and weightier than water and should droplet to the lowest of the bowl. Let the runny dish cleanser sit in the ball for 20-30 minutes. When is the toilet flushed water rises? Answer: If the flush is more energetic, then it is perhaps not a clog. If water backbones up into the ball and drains gradually, it is a clog. You even the toilet and babbling noises come from your toilet bowl. Can Drano be used to unclog a toilet? Answer: Drano uses corrosive or oxidizing chemicals to melt whatever is blockage a drain. The chemical response between the block and Drano makes heat. Now, Drano does not strong a clog promptly. It’s going to be seated in the latrine until the block melts. Why does my toilet keep clogging up? Answer: The flapper is the portion of your toilet that lets water movement from the cistern on the back down into the toilet bowl, making the flush. If the flapper doesn’t expose all the way it won’t announcement enough water, which income you’ll get a feeble flush. Clogs are shared in toilets with a feeble even. How can I make my toilet flush better? Answer: A pipe coming out from also the wall or the floor should cover the water source valve. Turn the handle of the regulator to the right to totally shut off the water. Next, decant a gallon of lightning into your toilet bowl and let it be seated for 15-20 minutes max. After you let the lighten sit, go ahead and even the toilet. Answer: The trick is there to save the toilet itself from blockage. The trap can get stopped though if it encounters with sure objects, like a kid’s toy, huge wads of toilet paper, or paper towels. A needle can take care of this problematic; with the rubber cover the entire fleabag, push up and down on the grip. What do plumbers use to unclog a toilet? Answer: Recurrence the drop and flush order until your block is gone. Every Plumber first tries to use hot water and dish cleaner (dish soap, shampoo, detergent and baking soda too). They add a few bowls of hot water to the toilet bowl before start plumbing. After you decant the hot water in, let it sit for an insufficient minute. If those methods not work then they try plunging, auger and toilet unclogging snake for the better result to unclog a clogged toilet. Can you unclog a toilet with hot water? Answer: Of course you can unclog it with hot water, just add an insufficient cups of warm water to the toilet ball before you start plumbing. After you pour the hot water into the toilet bowl, let it sit for few minutes. To put it lightly, the heat assistances break the clog up. This will unclog the toilet with the needle much, much easier. Answer: Get your pointers dull: One way of unclogging a toilet is to do it by a pointer. If you know what’s stuck in the toilet, then use your pointers to eliminate it yourself. Always wear ornaments and flush any residual debris down the gutter once you’re done. It’s not attractive but it’s real. Use hot water to prevent the toilet block: Sometimes all you need is seriousness and hot water. Torrential hot water into the toilet from a height cans bombardment the clog better than an even flush. Try Best way: Plungers are a real way of unclogging blocked toilet tubes. Turn off the water source before you twitch. Next, cover the gutter hole with the needle, forming a tight closure. Push the needle up and depressed, making sure not to disrupt the closure. Keep going until the obstruction is strong. 1. Point out your utilization of tissue. If you are utilizing more than you shouldn’t, flush it in additions to abstain from over-burdening the hole. 2. Guarantee that each item you flush down the toilet after utilize. Abstain from flushing substantial paper items, for example, paper towels, wet wipes, and female care items. These things may accomplish more than obstruct your toilet: they may make noteworthy harm your whole sewer framework. 3. Help kids comprehend that lone tissue is permitted down the toilet. 4. Call a plumber if following 30 minutes the clog up issue hasn’t been settled and the water level has continued as before in the toilet bowl. 5. When warming the water, take note of that 16 mugs makeup 1 gallon. 6. In case you’re worried about more water entering an almost flooding toilet when you endeavor to flush, distort the water valve that is situated behind the toilet and close to the floor. 7. Try not to empty bubbling water into the toilet since this could split the bowl. Managing a clogged toilet can be a baffling and once in a while humiliating experience. If utilizing a plunger hasn’t moved the clog up, attempt another move of how to unclog a toilet before reaching plumber. But in cases all the efforts don’t provide any result, it would be an act of wise to call the plumber. 13 My Toilet Works Again, What Next? 14.1 How do you unblock a toilet without a plunger? 14.2 How do you unclog a toilet fast? 14.3 What can you pour down the toilet to unclog it? 14.4 Can I use vinegar to unclog a toilet? 14.5 What liquid can you use to unclog a toilet? 14.6 When is the toilet flushed water rises? 14.7 Can Drano be used to unclog a toilet? 14.8 Why does my toilet keep clogging up? 14.9 How can I make my toilet flush better? 14.10 What clogs a toilet? 14.11 What do plumbers use to unclog a toilet? 14.12 Can you unclog a toilet with hot water? 14.13 How do you unblock a toilet?